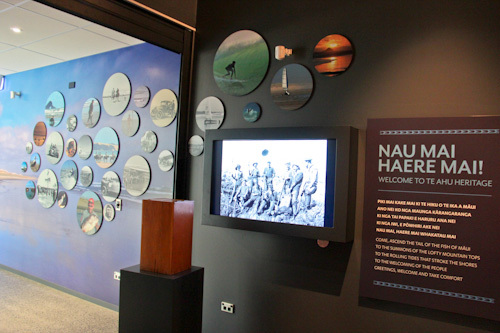 Today is the grand opening ceremony of one of Northland’s best architectural features — the Te Ahu Centre. 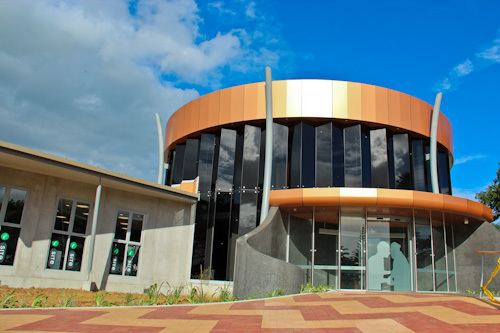 Located in Kaitaia, this multi-functional centre combines art, form and substance in a great building that the whole country can be proud of. 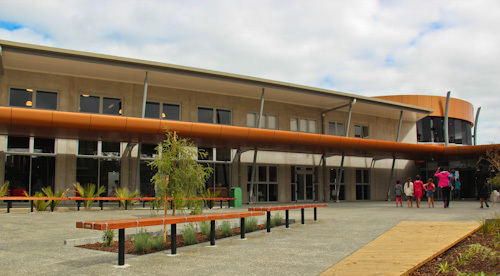 The Te Ahu Centre is a multi-functional centre that integrates a library, museum, information centre, cultural centre and council offices. A rear carpark provides access to the back of the building, but it's no less impressive. 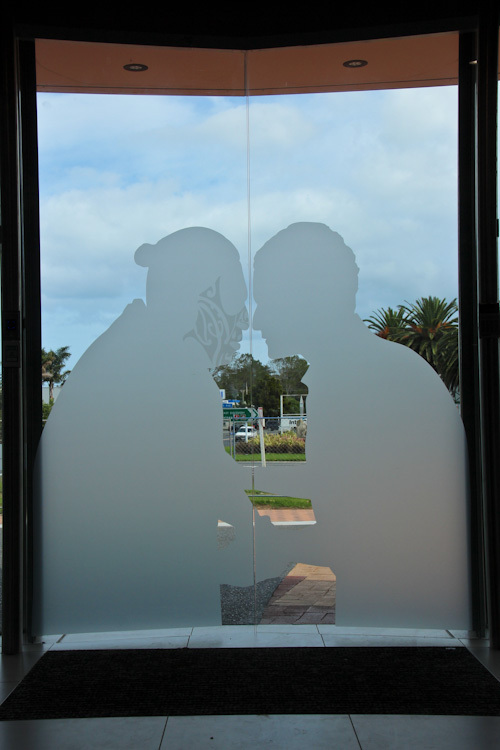 The main entrances feature automatic double doors with two figures etched on them — two men greeting each other with the traditional Maori "hongi" — a gentle pressing of the noses and foreheads. 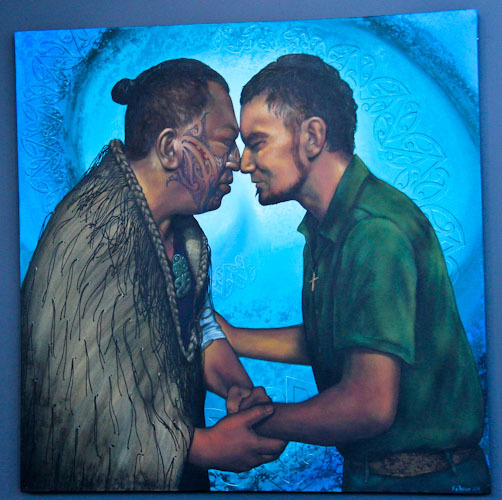 Maori artist Theresa Reihana's painting is the inspiration for the etching on the front doors. It hangs in the foyer for all to appreciate. Immediately upon entry, visitors are enthralled with the artwork on show in the grand foyer. 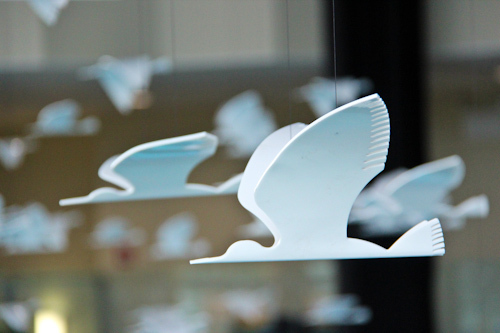 The birds flying in the foyer are kuaka (godwits). The migratory flight path of the kuaka from Alaska to New Zealand helped guide the first Polynesian settlers to New Zealand. 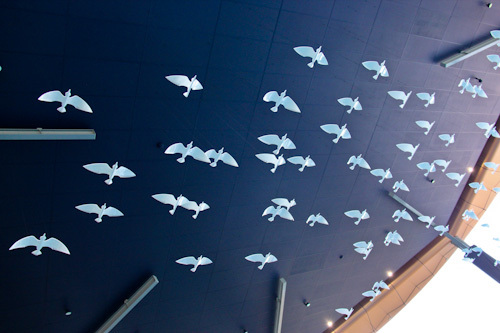 When flying south, the kuaka fly non-stop over the Pacific Ocean — a distance of over 11,600 km. I'm not sure that planes can travel that far without refuelling! 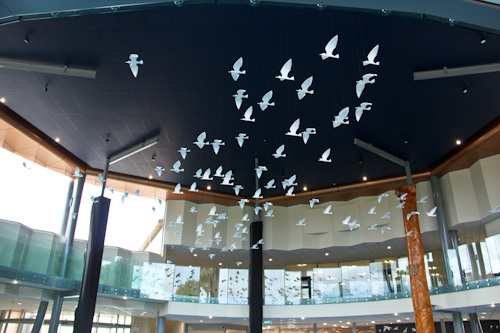 Each of the seven pillars in the main foyer tells the story of one of the main groups of people who have settled in the Kaitaia area. This is the Te Rarawa totem or "pou". 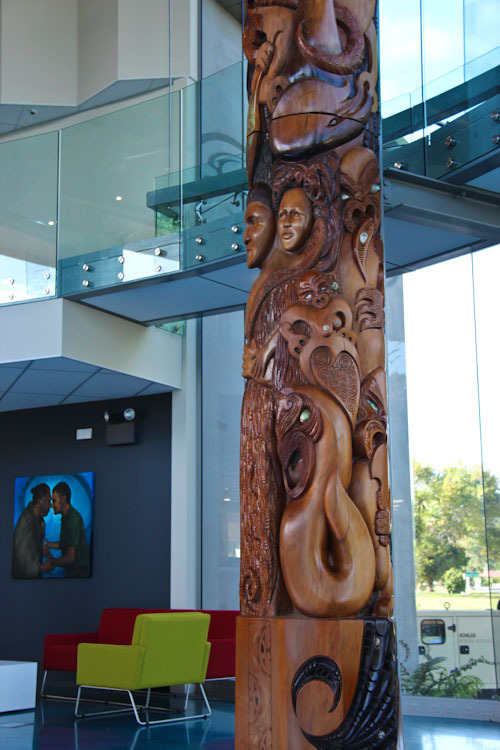 This pillar tells the story of the "Pakeha" — the English settlers. 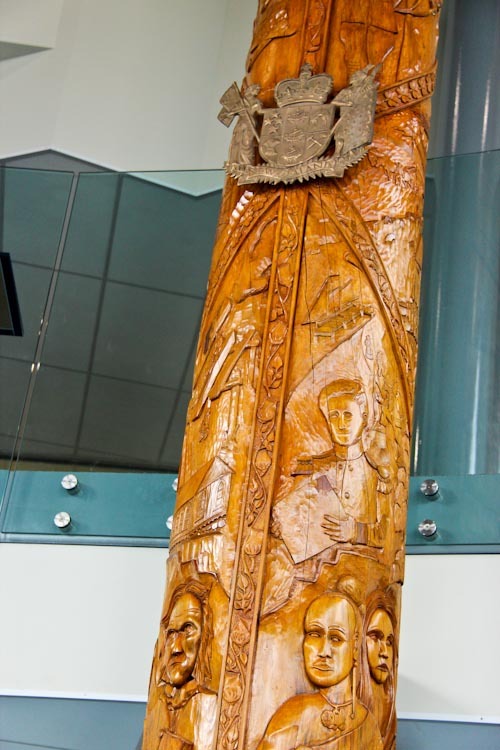 The timber pillars are intricately carved and decorated with local shells. The reception desk is decorated with more kuakas. 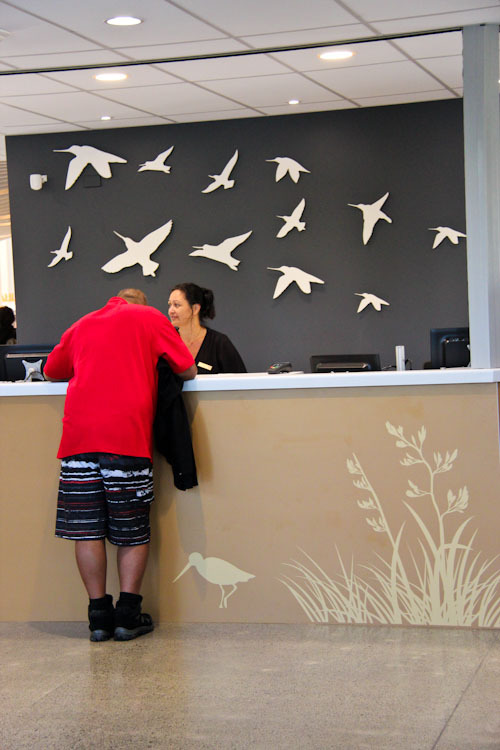 The friendly receptionists act as a first contact point for all the services offered in the centre. 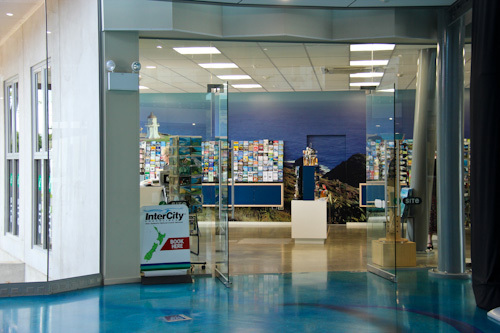 The public information centre is a great place to collect information on local highlights as well as tourist brochures from all across New Zealand. 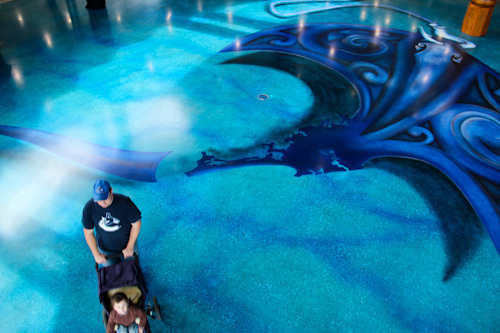 Although it's not immediately apparent, the floor of the foyer is painted with a huge stingray. In Polynesian/Maori legends, a hero named Maui hauled NZ's North Island out of the ocean as a stingray. 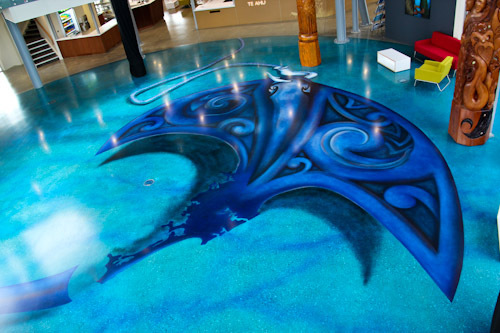 In the painting on the floor, the stingray morphs into a map of Northland — the far north of the North Island. 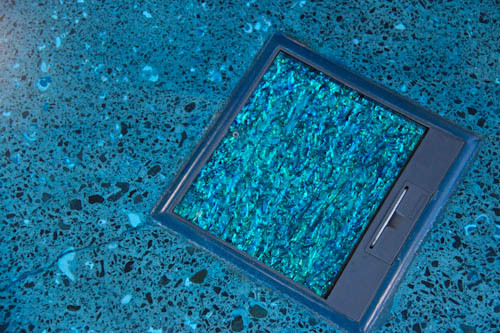 The recessed access points in the main floor are inlaid with beautiful paua shell. A walkway circles around the second level of the foyer to provide viewing access to the artwork in the foyer. 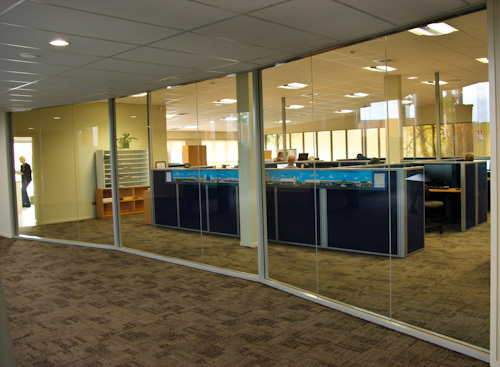 The Far North Regional Council has moved into new offices in the Te Ahu Centre. 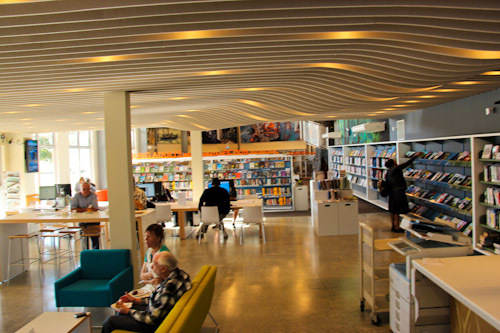 We usually visit the Te Ahu Centre to visit the library. 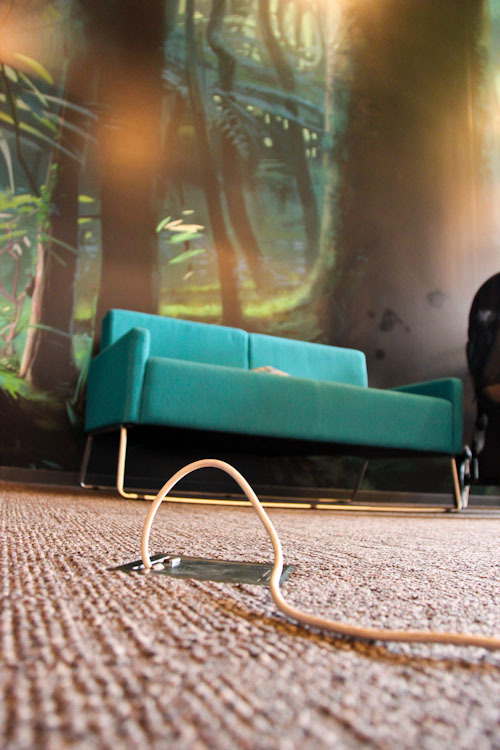 We like to charge our devices, access the internet through the free wi-fi network and read books from the shelves. Waves undulate across the floating ceiling in the entrance of the library, hinting at the beauty to come. 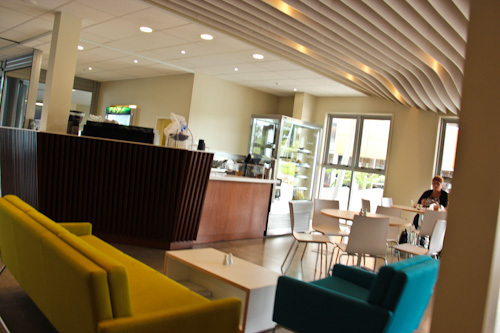 A café at the entrance to the library offers patrons a range of treats. 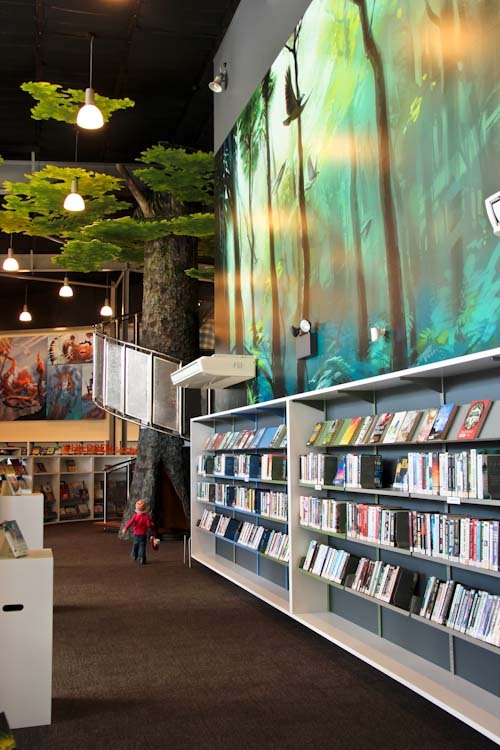 In the library, huge murals line the walls above the bookshelves. 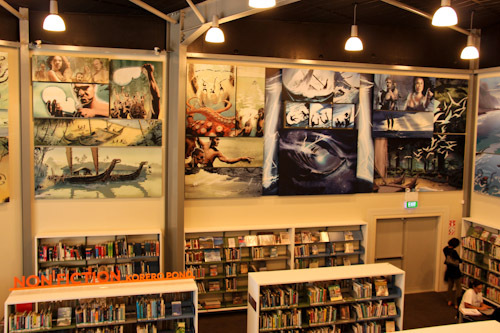 In the youth section of the library, the murals are illustrations that tell stories of the Polynesian adventurer Kupe who discovered Aotearoa (New Zealand) in the 900s. 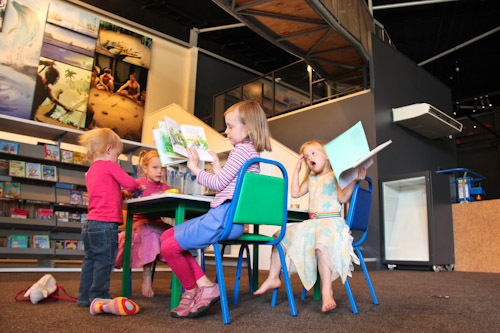 Our girls position themselves at the child-sized table and look through books that catch their attention. Access points are recessed in the floor, providing electricity sockets for charging devices. Our girls love it when I read through a pile of children's books that they've selected. 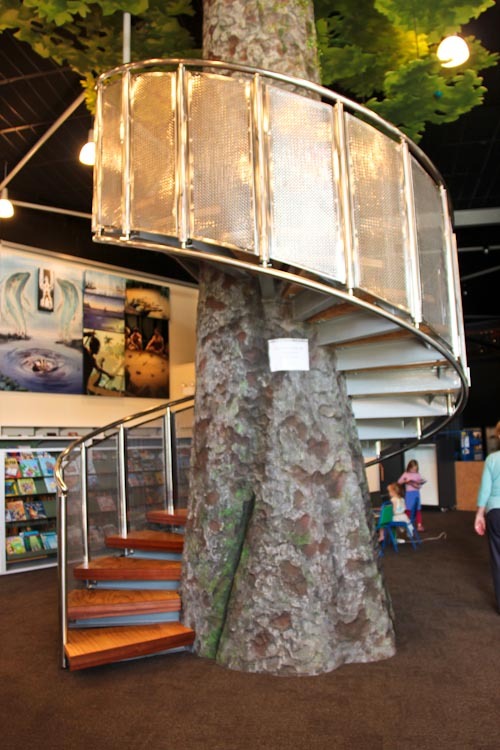 The main feature of the children's section is a life-sized replica of a kauri tree. Flat leaves are suspended around the tree's trunk, completing the kauri's look. At the base of the trunk, a hollowed section makes a wonderful reading nook. 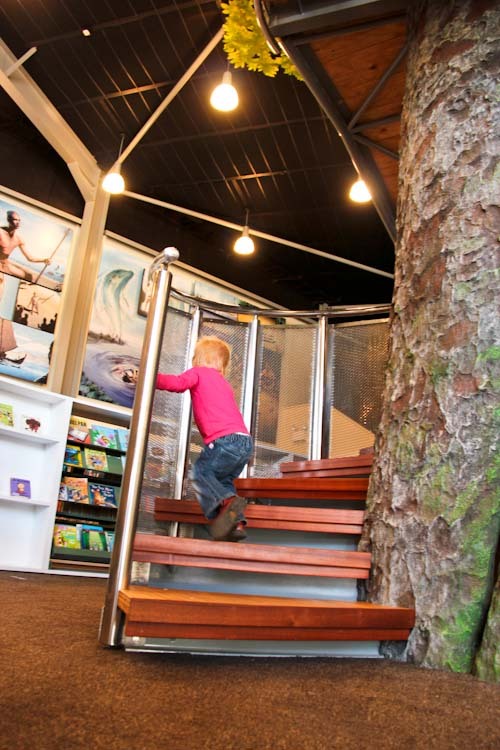 Delaney starts climbing the stairs that wind around the kauri tree. 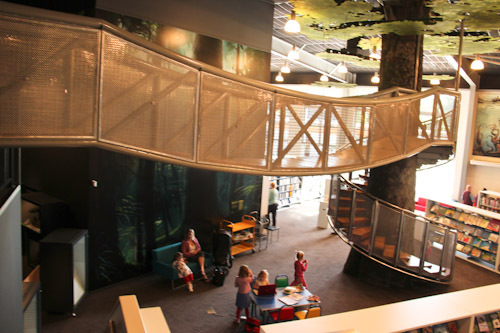 The stairs lead to a short bridge suspended above the children's section. 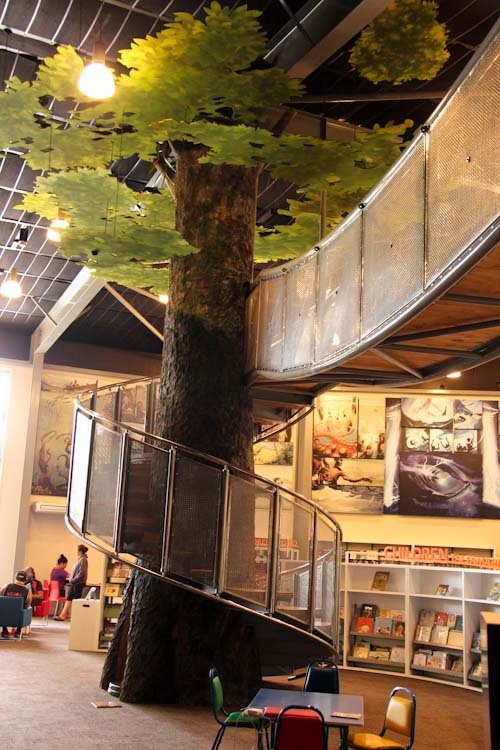 At the top of the tree, the beautiful timber and steel bridge leads to a platform on the other side which provides viewing into the heritage centre/museum. The artwork continues on the walls throughout the whole structure. Parallel to the library, the small museum/heritage centre provides public access to a cultural tour of the region’s history and art. The centre is run by volunteers and accepts donations rather than charging an admission fee. 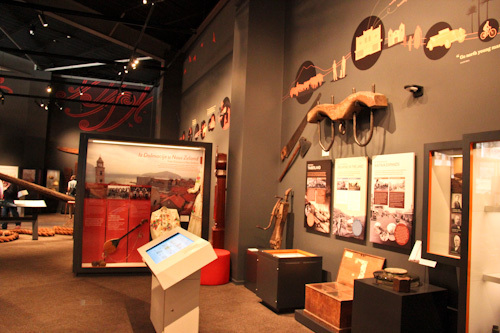 The museum celebrates Kaitaia's unique history and cultural heritage. 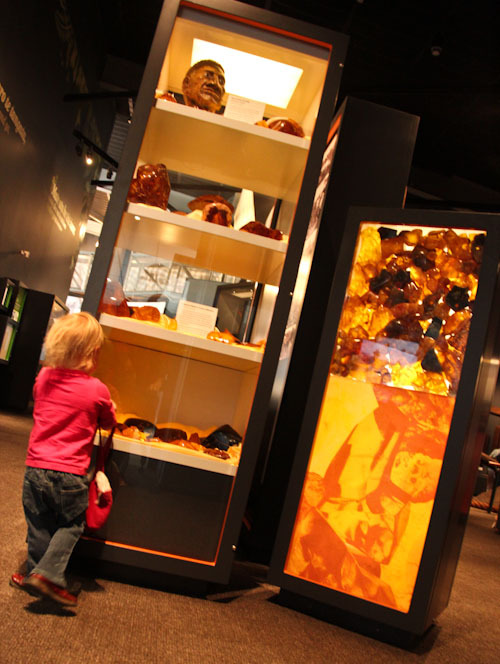 Of course, a fine collection of kauri gum is on display — this is kauri gum country. Historical pieces from European settlement tell stories of early agricultural practices. 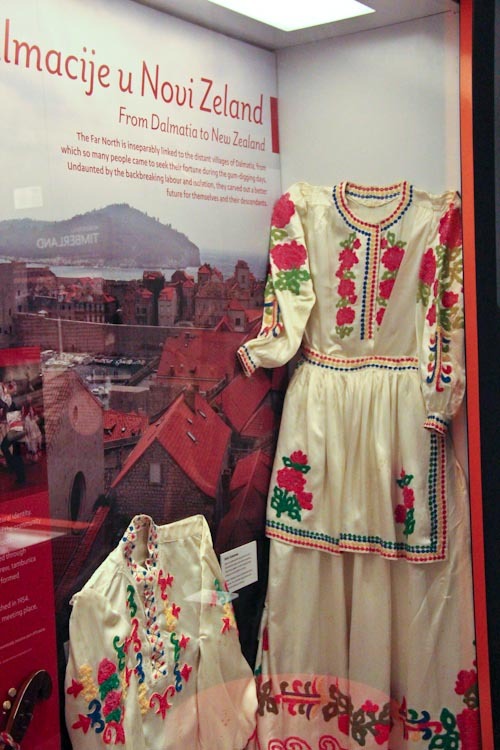 Many of Kaitaia's European settlers came from the Dalmatian region of Croatia. The Dalmatians sided with the Maori people in conflicts with English settlers and rulers, creating alliances that are still evident today. 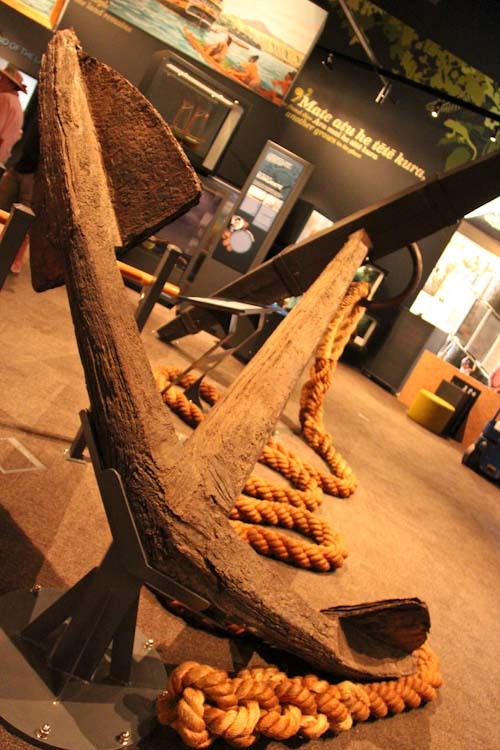 This anchor is the earliest relic of early European contact with New Zealand. It was left behind by the French vessel St. Jean Baptiste in 1769. 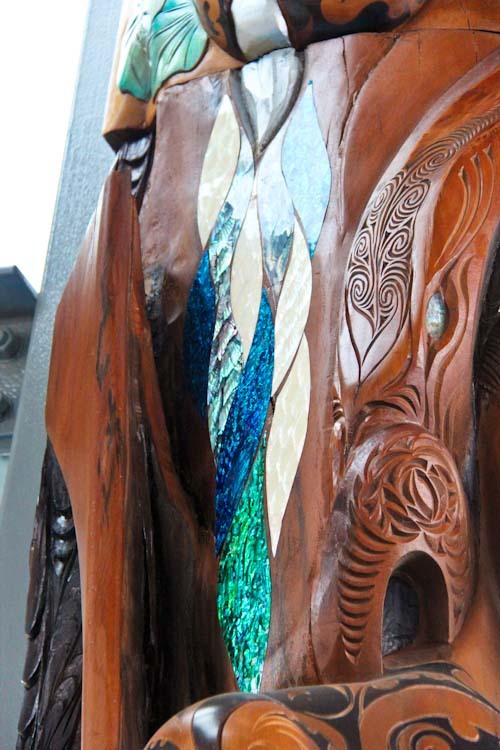 A fine collection of early Maori carvings are on public display. 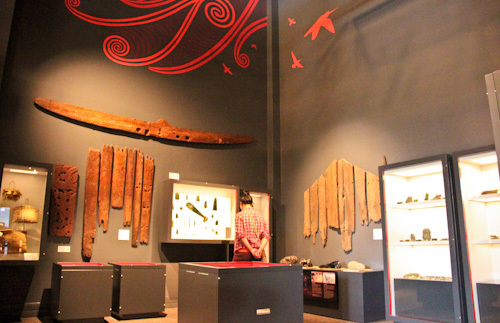 The museum is currently displaying "Tangonge" — one of the oldest and most important indigenous carvings in New Zealand. 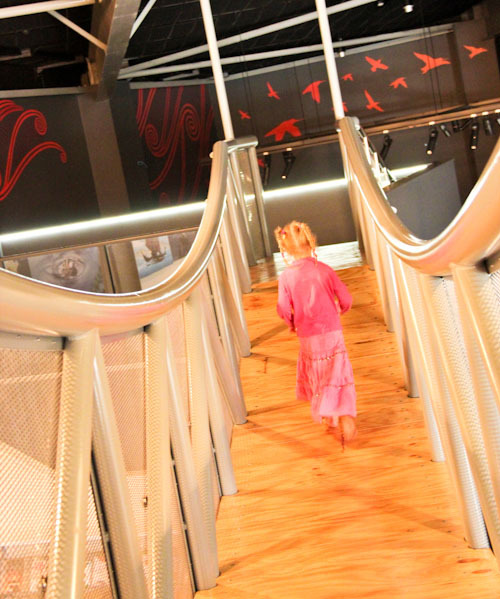 We love to visit the Te Ahu Centre. The facilities are first-rate and the toilets are probably the best in town. We’ve watched a film in the 106-seat cinema, David’s received a private tour of the museum, we are almost on first-name basis with the librarians, our children are comfortable with finding their way to all the facilities and I’ve enjoyed my talk with a friendly lady in the information centre. Kaitaia is on the way to the northern cape of New Zealand and attracts a lot of through-traffic. The Te Ahu Centre is a tourist destination in its own right, and I look forward to visitors and locals stopping to check it out while in town. 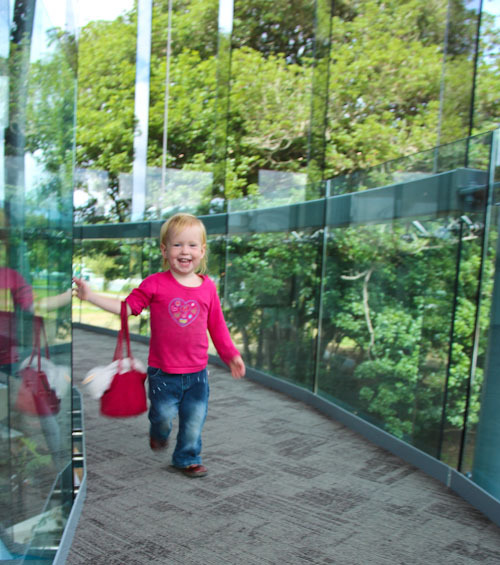 It’s world-class in its construction and beauty and is a must-see for anyone coming through Kaitaia. Thanks for your Beautiful Pictures of a Magical place. 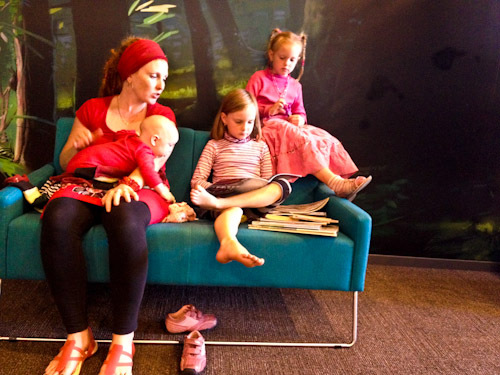 That looks like such an amazing place … my girls (and boy) would so love it! !